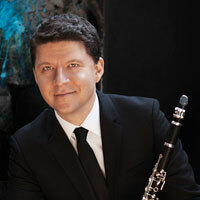 Due to a severe shoulder strain, clarinetist Martin Fröst had to cancel his appearance at last night’s final chamber music recital in the San Francisco Performances (SFP) 2013–2014 season in the SFJAZZ Center. He had been scheduled to perform with pianist Marc-André Hamelin and violinist Anthony Marwood in a program of duos and trios, almost all of which were composed in the twentieth century. Fortunately, SFP President Ruth A. Felt was able to find a replacement on very short notice in Alexander Fiterstein, who made his San Francisco recital début. One could not have hoped for a better concert, with Fiterstein performing with his colleagues as if they had been playing together for considerable time. The major twentieth-century composition that combines these three instruments as a trio is Béla Bartók’s three-movement “Contrasts,” composed in 1938 on a joint commission from violinist Joseph Szigeti and clarinetist Benny Goodman. It originally “contrasted” two movements, a highly ironic “Recruiting Dance,” followed by a wildly uninhibited “Fast Dance.” After the first performance Bartók decided that these needed to be separated by something quieter; and he composed the middle “Relaxation” movement. Last night “Contrasts” was the final work on the program; and it put the cap on an evening in which virtuosity and expressiveness were delivered with equal priority. The dry acoustics of the SFJAZZ Center were particularly conducive in enhancing the clarity of the complex interleaving of these three instruments, where the contrasts were established not only through sonorities but also performing styles. When this piece was first performed, Bartók himself took the piano part. Szigeti was a fellow Hungarian, and the two had performed together in recital on many occasions. However, Goodman was the wild card, since Bartók basically knew him through his jazz records. As a result, the clarinet part emerged as a series of “riffs,” none of which were, in any way, imitative of Goodman’s characteristic swing style. Rather, true to Bartók’s title, they were sharply contrasting interjections, all of which were perfectly consistent with the other lines of the musical texture. Last night’s performance perfectly captured this disclosure of contrasts. Each of the three performers displayed a solid command of the technical demands Bartók had imposed. However, that sense of overall texture clearly dominated the interpretation of the score, emerging through rhythms that established a thoroughly unique sense of “swing” without sounding like “highbrow” music trying to be “jazzy.” Through this rhetorical approach, Bartók’s trio emerged as the summa for the entire evening. Last night this suite was performed with a keen sense of balance through which each of the thematic elements that defines its own unique characteristics emerged with impeccable clarity. In this performance one could appreciate how well Fiterstein had fit his own part in among those of Marwood and Hamelin, allowing the attentive listener to appreciate just how inventive Stravinsky had been in conceiving both the whole and its individual parts. Furthermore, while Stravinsky himself tended to play up his capacity for abstraction, this was a highly personable interpretation, particularly in the sense of humor that sustained Stravinsky’s particularly arch approach to each of the popular dance forms. Fiterstein also performed two duets with Hamelin, Claude Debussy’s rhapsody (which he called “First Rhapsody,” although the only other one was for saxophone) and Francis Poulenc’s sonata. The rhapsody clearly suggests that Debussy was aware of how the clarinet had become an instrument for popular music; and the score emerges as a “meeting ground” for an encounter between “serious” lyricism and more “jazzy” exuberance. Fiterstein was clearly comfortable with this “other set of contrasts,” allowing his part to unfold almost as if it were an improvised monologue against the moody textures established by Hamelin’s accompaniment. The Poulenc sonata, on the other hand, was a somewhat more formal affair, seasoned by the occasional reflection on a earlier sextet he had composed for wind quintet and piano. Here, again, contrast was of the essence and one could appreciate an entirely different basis for interaction between Fiterstein and Hamelin. The duos performed by Marwood and Hamelin were even more contrasting. The program began with Franz Schubert’s D. 895 rondo in B minor, the only work not composed in the twentieth century. Hamelin was a bit heavy on the keyboard during the extended introduction that precedes the statement of the rondo theme. However, the rondo itself was executed at the necessary level of high energy, creating the sense that, around the time that a coda would have been in order, Schubert thought of something else to do. Indeed, he embedded a full ternary-form exposition of new thematic material in the middle of this piece, giving the sense that he just could not stop his pen from writing (any more than John Coltrane could keep from playing yet another improvisation on whatever tune he had selected for his combo). The “contrasting composer” for Schubert was, again, Debussy, with the G minor sonata that was his final extended composition. While the sonata is structured in three movements, they unfold in a highly discursive rhetorical style, almost creating that same sense of improvisation established in the clarinet rhapsody. Nevertheless, one is aware of Debussy’s discipline in this sonata, particularly in his economic use of thematic material. In this case the technique behind the score emerged with greater clarity through a better sense of balance between Marwood and Hamelin. The overall result was a highly satisfying execution of a program ingeniously conceived for its symmetries and its highly distinctive contrasts.